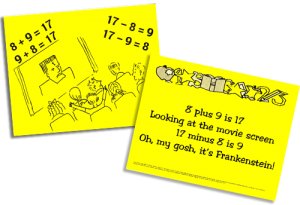 Memory Joggers » Learn How to Memorize Addition Facts! I’m an avid user of Pinterest but I am shocked to see so many postings teaching children how to count on their fingers or use touch math. 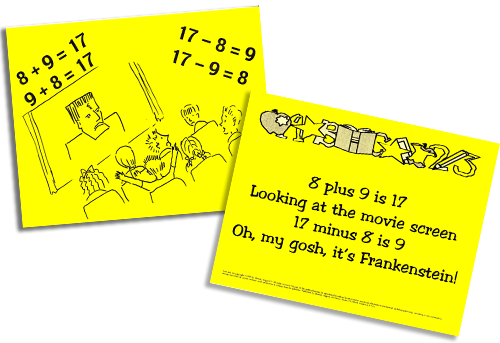 Whatever happened to teaching children to Memorize Addition facts? Maybe we should take a closer look at how to achieve this desired outcome. Once a person learns to solve an addition or subtraction problem by counting on their fingers, it often becomes a lifetime habit. How much time is wasted when a student is taking a timed test and has to use his or her fingers? Or is trying to use “touch math” by counting the dot locations? Plus it causes embarrassment for the student. When I was teaching third grade, I was shocked to find most of my students entering my classroom were counting on their fingers! One day I had recess duty and noticed children doing a clapping rhyme and repeating silly rhymes from memory. They knew 20 or 30 different rhymes. Suddenly I got a brainstorm! Why not write simple rhymes for each fact family and encourage them to play the clapping game using these catchy rhymes? It worked! By repeating the rhymes, the students remembered the 3 numbers in a fact family for addition and subtraction. I drew simple pictures illustrating the rhyme on one side of a large card and the rhyme on the other side. Visual learners remembered the picture and this prompted the rhyme. Audio learners remembered by hearing the rhyme and it’s sing-song cadence. Kinesthetic learners clapped out the rhythm and this made memorization easy. And of course the game was fun. In no time, boys and girls were memorizing the 3 numbers in the fact family while playing at recess. I began speaking at Teacher Conferences about the product and was pleased to see teachers responding so positively. I later added a CD so they could hear the cadence and rhythm plus an Add/Subtract Activity Book to reinforce the learning. Read more about the packages available. Spread the word and make memorization fun!